…..or maybe-eth don’t-eth, if we don’t pay enough attention. So it’s been a couple of days of bright sun, and our batteries are up pumping over 13 volts. We had made the mistake, as previously cited on this blog, of plugging the new fridge (Edgestar 3.1CU Foot) in after 4 days of rain and clouds when our batteries were already depleted. Of course, in initial cooldown, the fridge ran constantly for hours and our batteries were not happy with the situation. So we shut down the refrigerator, let our batteries recover for a few days, and used block ice to cool down the fridge, a practice we recommend when you have small solar and a new refrigerator. So for the last few days we’ve been using the edgestar fridge as a glorified ice box, keeping block ice in the freezer. I see now why this thing is as efficient as it is. The ice lasts forever compared to in our coolers. The insulation seems to be in excess of other compact refrigerators. We waited in the morning until the voltmeter reading was over 13 volts to kick on the fridge again. As a note, what you’re seeing coming off your battery bank in a solar system is a combination of the actual battery output and the input from the solar panels. We figured, based on times the panels were occluded by clouds, that our actual battery output was around 12.7 volts at the time. The difference is interesting. The output from you panels can be quite a bit higher than what your battery system is actually producing. For example, here’s a meter on the input from the two 100W solar panels. And the output of the battery stack was 12.72 volts at the same time. 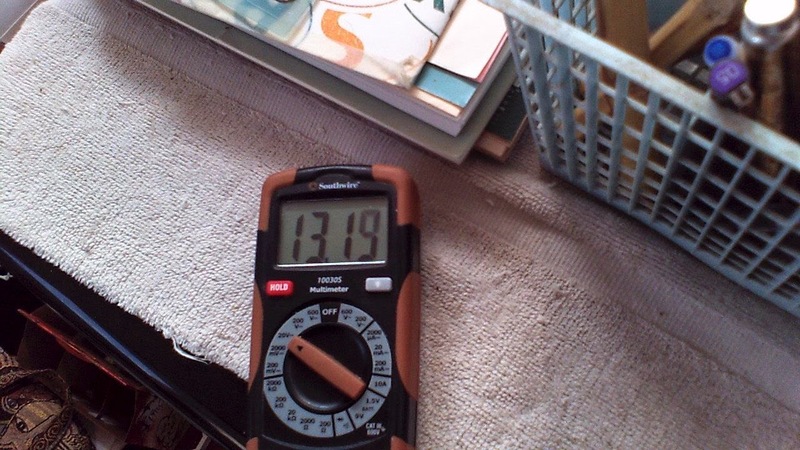 On plugging in the fridge, voltage from the bank dropped to 12.6V and held there for most of the day. As clouds rolled in, that dropped to 12.5 and then all the way down to 12.3 by late afternoon. Following some practices we’d picked up from Solar Cabin and others, we had put a large bottle of water in the ice box as thermal mass, which was frozen by the afternoon. A bit after 3PM, we turned off the fridge to let the system recover while there was still light and so we could charge some of our electronics. By sundown, the system had rebounded to 12.7V and the fridge….now a passive ice box…..was holding at 39 degrees F in the refrigerator section and 30 degrees F in the freezer. (as a note, food safe practices recommend that foods be held below 41 degrees F or above 135 degrees F). By 8:00 this morning, the fridge was still below 40 degrees and most of the ice in the freezer was….well….ice. So we’ll be following a pattern on the next few days of turning on the fridge when we hit 13V output on the batteries and back off in the middle of the afternoon so the batteries can recover a bit. We’ll see how this works, but for now, we seem to be keeping safe temperatures and to be able to maintain frozen foods without depleting our battery bank. If you have any ideas or better practices for small solar, please leave em in the comments below.